Designed to get the job done without breaking the bank! This machete is made in Colombia using British steel. 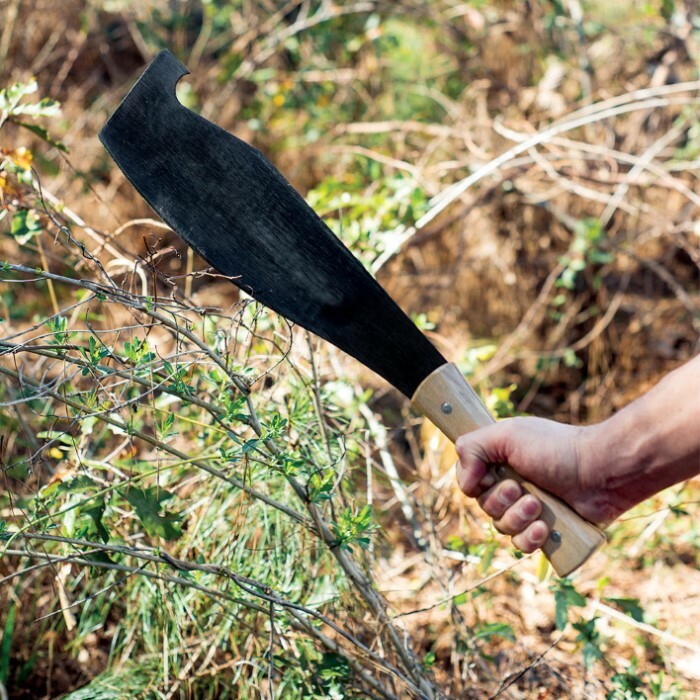 With its vast jungles, Colombia is no stranger to the machete market, and this piece is built tough. The handle is riveted onto the full tang blade. Comes as just the machete (no sheath). Measures 21 in. overall. Got 4 of these on BOGO. In its shipped form a couple of the edges were burred and the handles are gapped and not flush with the tang all around. The blade is a little thinner than had hoped, but being I bought them to bubba into the style of a poor mans daikaiju/ thai enep I think the reduced front weight should help make it feel stiffer. In the quick chopping tests I did the blades held an edge well even cutting through some dead hard wood. Overall for $5 a pop I am more than satisfied. Definitely roughly made I can see spending 5 bucks on this not much more though. Looks to be stamped out of thin sheet metal with a quickly ground edge on it. It is pretty wicked looking but it definitely needs a better edge put on it. Mine came quick, like usual from budk, but one half of the handle was broke off. Not a horrible purchase but I would go ahead and spend a few more dollars for a higher quality blade. Pretty heavy beast for a cane machete. The blade is about 2mm thick, maybe 1/3 thicker and 1.75" longer than theTramontina. Definitely a chopper. It seems that they now come painted black, rather than the blue/black finish that might have been prone to rust in transit. I have yet to strip it to see the finish underneath. Pretty cool working tool. Just watch out for that snagging hook! Sharpened inside, the hook would be great for snagging small, floppy vines like Honeysuckle or even berry canes. Just got my Colombian Cane Machete was not impressed .Rings like a bell when you cut with it . 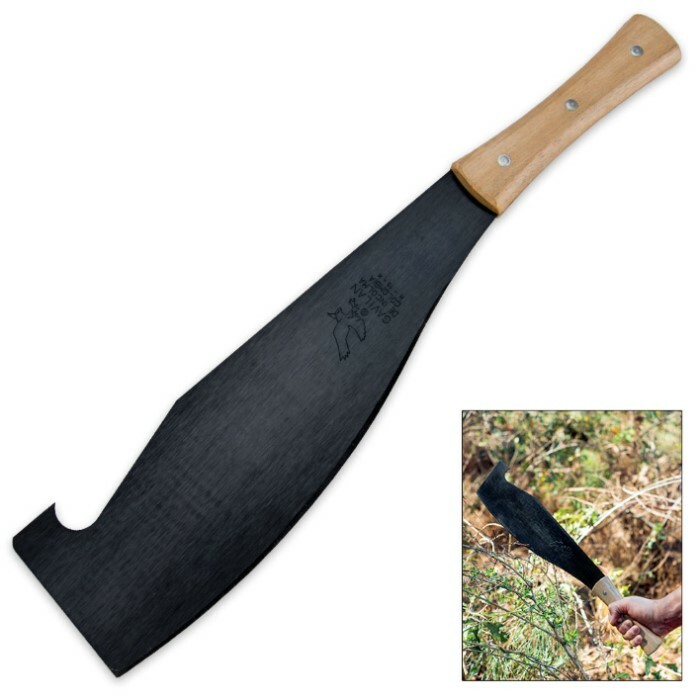 Needs sharpened and has thin blade (maybe 1/8 inch thick) will be a good fishing machete but not much else .You can buy better from BudK for just a few more dollars . Not a great knife would not recommend spend a few more dollars and get something better . 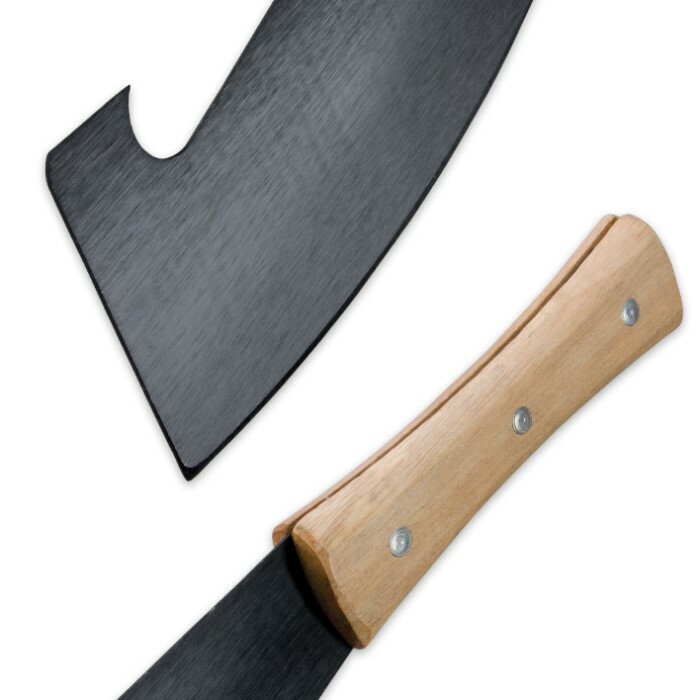 I laugh when I read that Gavrilan has "the best quality steel in the market" - this blade is the classic reworked automobile leaf spring, which may not make it the "best quality steel in the market" but makes for a first class cane cutter/machete. This design has been proven by thousands of peons over centuries of cutting and clearing in jungles and swamps and other tough terrains. The only objection is that the inner curve of the small hook on the back is not sharpened (easily remedied with the right tools and a bit of work). That part of the design, btw, is a godsend when climbing up steep, forested terrain and can be used to hook into a tree to make a handhold. This isn't pretty but it's a great blade for the job and available for less than a third of a Gerber Parang style machete. It handled the branches I used it on. It did come with quite a lot of rust on it....had to do some sanding. For the price, can't beat it. Love to find a sheath for it. What a value for $8.99, the steel on this is high quality carbon steel. Blade came very rough ground but only took a few minutes with a file to make it sharp as a machete should be. I also sanded and ground the wooden handles flush with the tang and rounded them and now the handles are vastly improved. Hit them with a coat of poly after shaping and rounding them. This Woodsman Pal style machete is now perfection for $9, highly recommended, I will be buying another soon. Awesome machete for the price. Did some testing on brush next to my house and the oranges on my tree out back never saw me coming. I'm a fan of the Gerber Gator series but this is almost up there with them for me. My only complaint (which is a minor one) is that my blade had some decent size surface rust on it, easily cleaned it up but that's all I can complain about so no big deal. I'll probably buy a few more while they are still this cheap to keep as spares or give away as gifts.